Venus had about the roughest start to life that a cat can have. Before she landed in Regina Cat Rescue's care, she was shot with a pellet gun and had two of her claws severely damaged by what looked like an attempt to manually declaw her. When she wound up pregnant and stray, some kind rescuers took it upon themselves to get her help and contacted RCR. Venus was able to raise her kittens in foster care and after they were weaned, she underwent surgery to have the two damaged claws and pellet removed. Now that she's had time to recuperate, Venus is ready for a forever home to keep her warm, happy and safe for the rest of her days! Venus is a loving and sweet cat who enjoys affection - she's happy to accept all the chin scratches and pets she can get - but isn't overly demanding. She gets along well with the two resident cats in her foster home and would be happy as an only cat or with a feline friend or two. She enjoys eating soft food, snuggling up with her foster mom at night and watching the squirrels and birds go by through the window. 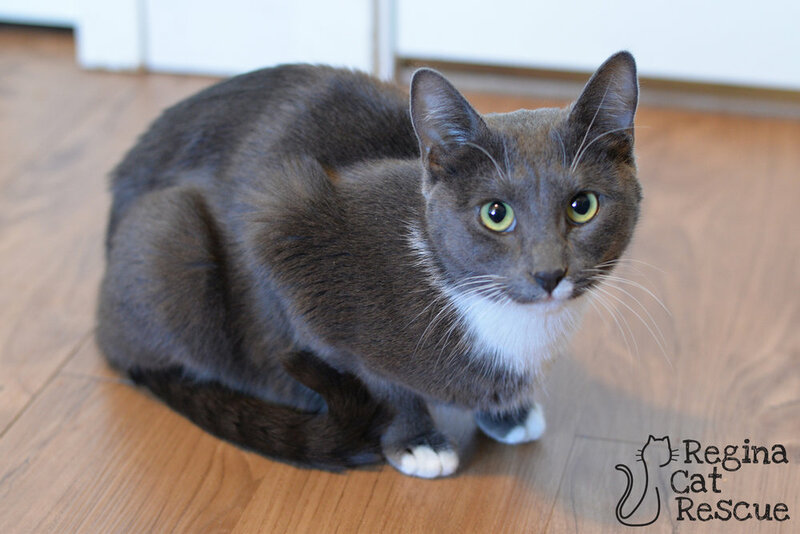 If you're looking for an all-around chill cat with love to share, Venus is the one for you! If you are interested in Venus, click here to view our adoption contract and click here to complete an adoption application or email the RCR Adoption Coordinator at rcradoptions@gmail.com for more info.